From the first step onto her mat, Brena knew she had to learn more and share yoga with others. For her, the best part of yoga is that there is always a class or practice no matter how she is feels. 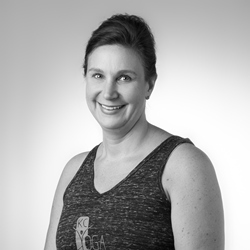 Brena is a certified yoga teacher through Kansas City Yoga Teacher Training and has spent time in trainings or workshops with Kelly Colln, Leah Morgan, Angie Eckenroth, Patricia Gray, Ramji Goodman, Girish, Doug Keller, and Judith Lasater. Brena is certified to teach Yin and Curvy yoga. She also recently completed her 200 hour certification with Max Strom Inner Axis. Brena is a wife and mother as well as a second degree black belt in Tae Kwon Do and studies with Master Se Han Kim. Brena’s yoga journey began when she started practicing with a fellow Tae Kwon Do student who was also a yoga teacher, Susan Harp. It was more fun than she expected and there was an immediate connection as she recognized how the two empowering activities overlapped while also offering complementary benefits like the intensity of Tae Kwon Do and the recuperative qualities of yoga. This led her to enroll in Kansas City Yoga Teacher Training where she has learned so much about the philosophy and practice of yoga from Angie Eckenroth, Leah Morgan, and Kelly Colln as well as completing additional workshops with Patricia Gray, Ramji Goodman, and Judith Hanson Lasater. Brena enjoys teaching vinyasa yoga and practicing anusara & meditation. She believes there is a yoga style for everyone and has never regretted taking a class, even on the days when she didn’t feel like dragging herself to the studio. Those often turn out to be the best days to practice. Teaching allows her to see students make that same discovery, returning again and again to their mat to learn and grow. Sharing the zen of yoga with students and creating a kula for a lifetime or just the hour of that class is one of the most rewarding aspects of teaching. Brena looks forward to her own growth as a teacher through additional training and building her own practice, exploring arm balances, inversions and her own mind, body, and spirit. Yin Yoga is a perfect complement to the dynamic and muscular (yang) styles of yoga as well as to most other forms of physical exercise programs. This deep stretch class targets the deep connective tissues and fascia of the body. It focuses on areas that encompass a joint (hips, sacrum, spine). It is unique in that you are asked to relax in the posture.